Yesterday, my op-ed on candidate fundraising appeared in The Hill Times. Due to space constraints I was limited in what I could summarize from my dissertation research. So over the next few days I’ll post some additional analysis on findings I think are particularly interesting. What is the relationship between a constituency’s competitiveness and a candidate’s fundraising? Obviously, we should expect a strong relationship. And the data from the last three elections clearly points to that conclusion. 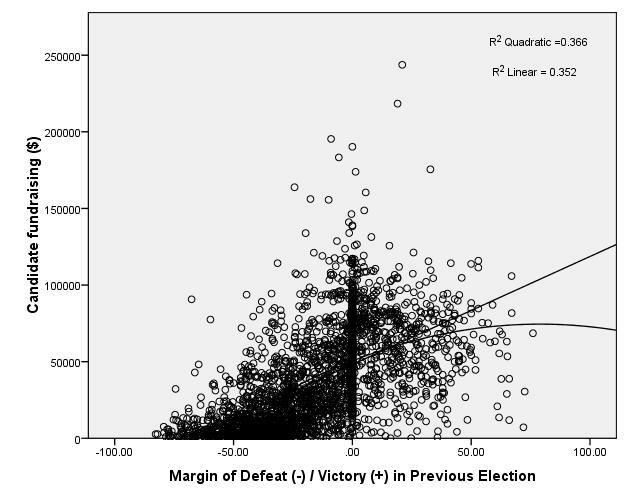 A simple scatter plot between candidate fundraising ($) and the margin of victory/defeat for the candidate’s party in the previous election shows a strong, almost linear relationship. As the competitiveness of party in the previous election increases (move left to right on the chart), so too does fundraising. When the quadratic line is added into the chart though we do see a small curve develop when the margin of victory passes the 25% mark. This is expected and will become more clear when I discuss outliers later in the week. As the probability of defeat decreases for a candidate, the incentive to raise and spend money also decreases. Hence, the curvilinear relationship between previous party performance and fundraising. But is competitiveness important when we control for other variables? The answer is absolutely! The performance of the party in the previous election is the strongest predictor of candidate fundraising. The model predicts, all else being equal, that a candidate running in a constituency where the previous party’s candidate was 10 percentage points behind the winner will raise $3,349 less money than a candidate who’s party was within 1 percentage point of the winner.